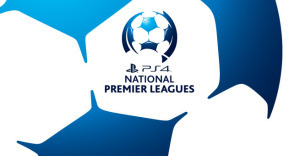 Northern NSW Leagues PlayStation® 4 National Premier League’s (PS4 NPL) Round 12 Match of the Round will be contested between the top two sides on Sunday afternoon as Edgeworth Eagles host Hamilton Olympic. It is one of two hotly anticipated top four clashes in Round 12, as the third placed Bears take on the fourth placed Jaffas away from home. Edgeworth enters Round 12 in amazing form, having won seven of their last eight matches, most recently a 2-1 win over Broadmeadow Magic. They have won the most games this season with eight, and along with three losses they sit in second on 24 points. Hamilton lead the competition, however only by a sole point after their Round 11 draw with Adamstown. This season they have won seven and drawn four, remaining the only undefeated side in the competition. Edgeworth’s Westfield FFA Cup fate was decided yesterday in the live draw on Fox Sports News Channel 500, as they drew host to Hyundai A-League club Melbourne City, a massive opportunity for the players, coaching staff, fans, and the club itself. Whilst an overwhelming prospect, Damien Zane suggested his side need to stay focused on the job at hand: defeating Hamilton and going first in the PS4 NPL. ‘All the boys are excited to play Melbourne, but they need to get their mind back on this weekend’s game and try not to focus on that match just yet,’ he said. ‘We have gotten ourselves in a position to fight for the premiership, and there is not long left in the season. Hamilton are undefeated so we need to be the first to beat them’. ‘I have never had to give a rocket to the team at half time all season. The boys are playing great and getting what they deserve, and it would be great to go to the top of the table this weekend’. Edgeworth will be without their main man between the posts Jim Fogarty after he popped his AC joint in his shoulder in a collision with Magic’s Scott Pettit last weekend. Zane was disappointed for Fogarty, but is confident in his replacement. ‘Jim will miss between four to eight weeks, probably closer to six or eight. We are very lucky we have Ben Smith to back him up, Jim was in very good form but Ben is a great keeper and will stand up for us’. Olympic coach Mick Bolch was slightly disappointed after last weekend’s 2-2 tie with Adamstown, suggesting that ‘draws are starting to catch up with us, and at the moment they are almost as good as losses’. A draw this weekend would be huge as it would keep them in first place, however the side in blue and white will be determined to take home the three points and stay at least three clear at the top of the table. The grandstand at Jack McLaughlan Oval will be the best place to watch this crucial match, however if you are not able to attend the game will be streamed live on Bar TV, along with post match interviews with Zane, Bolch and the man of the match. Lambton Jaffas welcome Weston Workers to Arthur Edden Oval this weekend to contest the second grand final rematch of the season. The last time the sides met was in Round 2 when Weston won 2-1 at home. The Jaffas opened the scoring through Alex Palozzi, but the Bears equalised before half time through Rob Macbeth, and then Garry McDermott scored the only goal of the second half, which turned out to be the winner. Since then Lambton have been in good form, racking up 18 points in nine games. They are currently fourth on 21, just four points behind leaders Hamilton. A win for the Jaffas this weekend would see them finish at least third, and at the most, four points off the top spot. If the Edgeworth Eagles lose to Hamilton and Lambton win, they will finish the round in second place. The Bears are one place ahead of the Jaffas, and one point ahead. This season they have won seven, had one draw, and lost three. Weston also have an opportunity to go to second if the Eagles lose, as they are just two points behind the second placed side. The Jaffas have experienced great success in recent weeks, undefeated in six rounds, having won their last four, however coach Dave Tanchevski is aware that their biggest challenge is yet to come. ‘We are on a good run, however we have a hard run of matches the next four games where we take on the three sides above us, and Broadmeadow who are one below,’ he said. ‘It will be a very hard challenge but it is one we need work hard to overcome’. Bears coach Trevor Morris is extremely excited heading into this match, but is aware of the threat the Jaffas pose. ‘Lambton are a good team full of good players and we will need to perform well to get a result,’ he said. ‘It is a Grand Final rematch, and the boys won’t need any extra motivation for this match at all’. The form that these two sides are in this year should be concerning for all other teams in the PS4 NPL competition at present. This time last year they sat in the same positions; Weston third leading Jaffas fourth by a point. This season however, they both have four more points to their tally, and the Jaffas an extra win whilst Weston have had two extra wins. The Jaffas have lost half the amount of games this year (two) as they had at this stage last year (four). This match will be a huge event for both sides and the PS4 NPL itself, and is a brilliant way to kick off Round 11, as it is one of two top four clashes between two sides determined to finish the round in second place. The latter of the two Saturday matches sees the Newcastle Jets Youth travel to Ulinga Oval for the second time this year to challenge the South Cardiff Gunners. Both of these sides are desperate for a win after poor recent form in the PS4 NPL competition, as both sit far lower on the table than where they would ideally like to be. Both sides have lost their last five, in fact combined they have lost their last 13, the Gunners having lost seven, and the Jets six. The Gunners have won just once in 2015, and combined with two draws they occupy last place with five points. The Jets Youth have won three matches this season, drawing one and losing their remaining seven. They are in seventh place on ten points. This time last year the Jets Youth side led the competition. They were on 23 points, four ahead of their nearest rival and they had seven wins as opposed to the seven losses this season. The club as a whole have gone from strength to strength in recent weeks with the addition of a new First Team coaching staff, a new major sponsor, and three successful forums that engaged businesses and the community. What the Jets will be hoping for now is that their Youth Side can start stringing together some better performances and results. The Gunners are aware that this is a must win match as they sit in last for the second week in a row. Maitland have pushed themselves five clear of the bottom spot, so the Gunners need to ensure they keep within distance of Charlestown, and will hoping to go ahead of them this weekend. They finally have some good news to enjoy, as Mat Grey, Lee Ashton and Dean Kelley will all take the park after long injury lay-offs. Unfortunately for the side they will only play in the Under 22’s, as they continue to recover and return to full strength. The Gunners have a new signing to boast with the acquisition of Lee Soo Myung, who has transferred from the Lambton Jaffas. Coach Greg Asquith suggested that he will play in the reserve side at this present time as the club have already filled their two visa spots with fellow Korean, Deok, and the first ever scorer in the Westfield FFA Cup Lee Ashton, however he is considered as a standby for Ashton who has missed the better part of 2015 through injury. Sam Parker will also make his starting PS4 NPL debut this weekend for the Gunners after bagging a hat trick in the Under 22’s side last weekend in a 6-3 win over Weston. The last time these two teams met, the Gunners overcame a 3-1 deficit to draw the match 3-3. Both sides will be hoping to score a similar amount of goals this weekend, but will be intent on keeping their first (Gunners) and second (Jets) clean sheets respectively as they look to end the second third of the PS4 NPL season with a win. In the second of three Sunday matches, Adamstown Rosebud host Charlestown City Blues at Adamstown Oval. The Rosebud are in hot form in the PS4 NPL, having won four of their last six, remaining undefeated in the two month period by drawing the other two. They are currently in sixth following their four wins, four draws and three losses in 2015. The Blues remain in ninth after a 3-1 loss to Lambton last weekend. It was their ninth loss of the season, however their two wins keep them ahead of South Cardiff by a point. Adamstown were disappointed to learn that Garry Kenneth’s hamstring injury that he suffered in a Westfield FFA Cup win over Valentine two weekends ago has sidelined him for the remainder of the season. Kenneth has been solid at the back for the Rosebud, and has chipped in at the other end of the pitch with five goals of his own. New signing Kim Tae Sung was set to make his PS4 NPL debut in two rounds time, however was cleared to play in last weekend’s match against Hamilton as an injury replacement for the departed Kenneth. Adamstown coach Graham Law is excited by his side’s recent form, as they are now undefeated in six games, four of which they have won. ‘No disrespect to Guy or Garry, but after we lost Guy Bates we went on to win four out of five, and now after losing Garry Kenneth for the season we go out and give the leaders a real good run which is very positive’. ‘When we were five games in we had just two points to show, but I kept saying we are better than that and since then we have proven that’. A win for the Buds this weekend will see them move to fifth if Maitland take points from Magic. On the other hand Charlestown can move four points clear of the dreaded relegation spot if they get the three points. Both of these sides have huge motivation to get the win, and as a result the Adamstown Oval crowd will have witnessed a hard fought match from both teams when the full time whistle blows, regardless of the score line. The final match of Round 12 of the PS4 NPL season takes place just around the corner from Adamstown Oval, as Broadmeadow Magic take on the Maitland Magpies at Magic Park. Broadmeadow’s fall from the top four continued last weekend as they lost 2-1 to second placed Edgeworth Eagles. They are now four points outside the top four on 17, following five wins, two draws and four losses this season. Maitland recorded their third win for 2015 last weekend, after a Matt Thompson strike was the difference between them and the Newcastle Jets Youth. Alongside a draw and seven losses the Magpies are on ten points in eighth spot. Yesterday afternoon the Magic learnt their fate in the Westfield FFA Cup, being drawn to play against Heidelberg United in front of a home crowd at Magic Park. Heidelberg United are a PS4 NPL side from Victoria, who currently sit third after 18 matches, trailing leaders Bentleigh Greens by just six points. Between the sticks for United stands Griffin McMaster, former Brisbane Roar keeper who played 20 Hyundai A-League games for the three time Champions. Last time Maitland met Magic Dino Fajkovic tore the Magpies apart, scoring four goals as Magic recorded their first win of the two week old season with a 5-1 victory. Since then he has scored four more, and has seven Westfield FFA Cup goals to his name, making him a very smart signing for Magic. They will be hoping he can fire this weekend as they look for their first PS4 NPL win in over a month. Maitland have improved drastically since that match, and now have some stability with Reece Thompson at the helm and former First Grade coach Anthony Richards as his assistant. Thompson is feeling excited about the remaining seven games, and believes his side can turn a few heads. ‘Before the start of the South Cardiff game (after Round 1) we said that our season would start from Round 2 (Round 9),’ he said. ‘We are two from two since the start of Round 2 (Round 9) and with guys like Rob Ambrogetti and Ryan Clarke to come in competition for places will continue to get harder’. They will have the chance to prove this is the case this weekend, and if they are able to hand Magic their fifth loss in a row, the Magpies could possibly start thinking about a much higher finish in 2015 than many would have predicted a month ago.